So now you’ve got a list of reasons why you want to join the police. Have a look over the list and remove any that will not affect you constructively or provide some benefit to the community. If nobody gains anything from a reason, it is not going to be much use to you. If once you’ve done this, your list is very short or non-existent then you must seriously reconsider if being a police officer is for you or if you are ready to become a police officer. I want to carry a gun. I want to have power over other people. I want to tell people what to do. If you are happy with your list then continue on. There is a very important reason we’ve done this activity and that is so you can select your best reasons. You must be satisfied with each reason and also clear on which are your most useful. Number One: If you do decide to go ahead with your application you are going to be in for a long and sometimes arduous process of selection and training before you can even make it to the police academy. You need to know your best reasons and keep them clear in your head on a daily basis so that you don’t lose your personal drive for why you are putting yourself through the rigours of the selection process. Number Two: When you make it to recruiting you will have a concise and confident list of reasons as to why you want to be a police officer. 1. I want to be respected by my friends and family. 2. I want to work as part of a team. 3. I’ve always thought about doing it and am curious. There is nothing wrong with having these sorts of reasons but they are weak in all three of the categories mentioned above. Primarily they are weak reasons to drive me to action and will not make me put effort into my preparation. Secondly they are very weak if presented to recruiting. Their response is likely to be, “Is that the best reasons you’ve got?” Thirdly, if you give these reasons to friends and family, it will sound like you are completely self-centred and just doing it on a whim. Which also presents poorly to recruiting officers for the same reasons. But how can that be if there is nothing wrong with them as reasons? The reason is because nobody else knows about the rest of your list. You have to consider why people are asking you and select appropriate responses to them. This is not being dishonest, it is communicating effectively and presenting yourself in a smart fashion. You should be sick of saying your three main reasons by the time you get to a recruiting interview because you know them so well! 1. I want to serve the community in a more tangible way than my current employment offers. I want to help and protect local Australians in the area where I live. 2. I want a job where I am physically active and get out of the office on a regular basis. 3. I want to catch bad guys. I’m not proposing this becomes your list to tell people but I will explain why it is a more useful choice than the previous three. These reasons apply regardless of talking to myself to maintain my interest or talking to recruiting staff and friends and family. The first reason states that I’m doing it for unselfish reasons and have strong community values. It gives me daily inspiration that it is a goal worth working towards. It gives specific reason as to why I’m joining this particular State police. The second reason shows that I have done some research into what police do and that I am interested in the more active component of police work. The third reason reminds me not to take it so seriously and that it doesn’t have to be all about what helping victims all the time. It shows other people that I’m interested in the more exciting aspects of being a police officer and I’m not afraid to get physically involved when required. I also like this reason because it sounds more ‘real’ than the first two which are both very ‘principle’ based and sound very formal. These are my personal preferences only. They are not a magic template of reasons to join the police. The purpose of this activity is for you to get clear on your own reasons and start practising telling other people why you want to be a police officer. The great thing about writing this down is that it will be great inspiration for you to read further on in your career when you may be dealing with a longer list of why not to be a police officer. Read out loud your three best reasons for becoming a police officer. Are you ready to become a police officer? If your answer is yes, that is great news and congratulations. 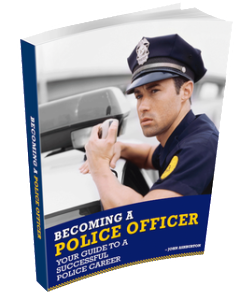 This 40 page eBook, Becoming a Police Officer, is designed to assist you answer this question in detail and set you up for success long into your police career. The great philosopher Friedrich Nietzsche, said “if you have a strong enough ‘why’ you can endure almost any ‘how'”. So find out the reasons that will get you through each day and get you selected in the next Police Squad!